In the forest of Silverwood you won’t just lose your way, you’ll lose your mind. A dark force lurks among the trees in the forest of Silverwood. Welcome to the most terrifying camping trip of your life. Silverwood: The Door is the follow-up to Silverwood, an original video series from Tony Valenzuela’s Black Box TV (episodes are available on YouTube). Keene acts as showrunner for a writers room featuring Cemetery Dance founder and publisher Richard Chizmar, Stephen Kozeniewski, and the “Sisters of Slaughter” – Michelle Garza and Melissa Lason. The result is a 10-episode series, released in weekly installments in both prose and audiobook formats beginning in October. The team promises a mix of horror styles encompassing slashers, splatterpunk, psychological, Lovecraftian, and more. 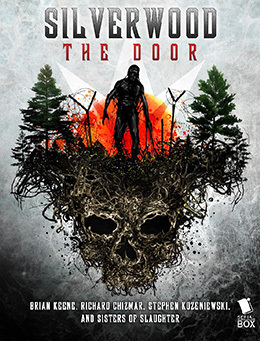 Silverwood: The Door is now available. You can preorder the entire 10-episode season now and start reading them as they are released in weekly installments in October. There’s also an audiobook option, and the Serial Box app or website will keep track of where you are—so, if you want to start reading and then switch to the audiobook, you won’t have to hunt for where you left off in the episode.